Canvas Host Review 2019: Is Canvas Host a Good Hosting? Canvas Host was founded in 2002 by David Anderson, an IT professional who wanted to bring the human element into a lackluster and impersonal hosting industry. They offer personalized support at all levels and adhere to eco-friendly business practices. 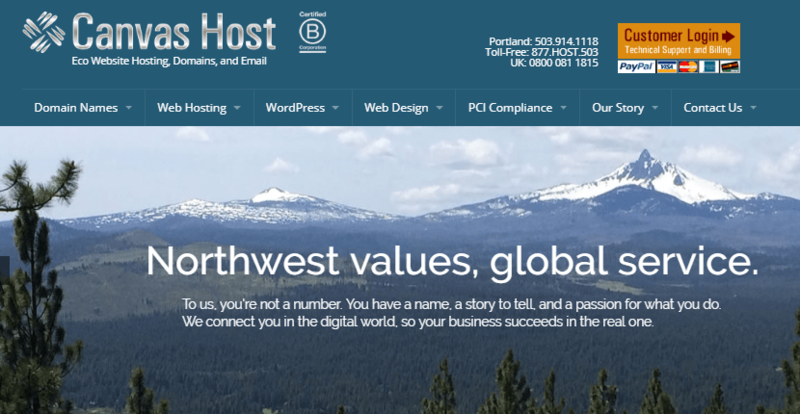 Based in Portland, Canvas Host is a green web hosting company that provides stable shared hosting plans and VPS solutions with 30-day money back guarantee along with services such as web design and domain registration. Each shared hosting account comes with cPanel, which enables you to easily manage your storage space, emails, files, databases, and security. With the beginner-friendly Canvas Host, you won’t need coding or HTML knowledge to build a website. Using Installatron – a free one-click installer – you can install your favorite CMS. The popular Weebly website builder is also included. With its simple drag-and-drop interface, you can design and deploy a functional website within minutes. Then, once you’re done, you can use the well-tested CloudFlare caching to speed up your website by up to 200%. You’ll never get stuck navigating or managing your web space. On their resource section, you will find many wonderful tutorials that will guide you every step of the way. Canvas Host takes user security and safety seriously. They run automated malware and virus checks on websites and apps hosted on their server. All their email accounts including basic ones support anti-spam filtering. Critical incidents are dealt with promptly on-site before they escalate and affect the performance of your website. In addition to this, they also run regular malware and virus checks on all of their clients’ websites. Moving up, you can order virtual private servers based in Portland, with geolocated IP addresses. Three plans are available all running on CentOS: VPS1, VPS2, and VPS3 with between 10GB-30 GB storage and 200GB-600GB bandwidth. Their VPS are suitable for customers who want more customization options or specialized hosting for their apps and websites. With their plans, you get dedicated RAM, storage space, and IP addresses. You’ll also get full root access and SSH with the option to use cPanel and/or WHM. Aside from shared hosting and VPS, they also offer reseller hosting and PCI-compliant website hosting for e-commerce websites with shopping cart integration and multiple checkout options. If you want to build and host a website for your non-profit organization, charity, or CBO, you should consider their discounted non-profit hosting plans. Looking at their prices, you can tell they cater for various budgets. Though slightly expensive, their packages have zero setup fees and come with a good number of features that you won’t find at the bottom of the pyramid. You can save more by signing up for six months or longer. Long-term prepaid plans qualify you for up to 25% discount. Canvas Host’s shared, reseller, PCI-compliant, and even VPS hosting all come with a 30-day money back guarantee and a “no overselling” policy. All their hosting services are backed by 24/7 technical support. Their technicians monitor the security and performance of all their servers (including colocated ones). If you need help to replace your equipment or patch software, open a ticket or call their toll-free support number between 5am-8pm Pacific Time (or 8am-8pm if you’re contacting them on the weekends). I especially liked that they also have local numbers for the United States and United Kingdom. You can also email them or submit your questions through the contact form on their website. True to their original vision, Canvas Host has done quite a bit to ensure a warm, personal support service regardless of whichever tier of hosting plan you’ve purchased from them. When I contacted them regarding a DNS issue, I was greeted by a support agent who knew my name and seemed to really know my account history. He helped me figure out the root problem quickly and resolved the matter within a day. Small as they are, Canvas Host offers a range of feature-rich, scalable hosting packages at good prices in addition to fantastic and personal support. Wondering how Canvas Host stacks up against other Web Hosting companies? Enter any other Web Hosting company and we will give you a side-by-side comparison.